Nothing amazing here, but it’s satisfying. We got some white meat chicken nuggets (lettuce as a prettifying and edible liner) with Kewpie mayo mixed with Sriracha sauce. You could probably get me to eat an old shoe sole if you put enough of this condiment on it. 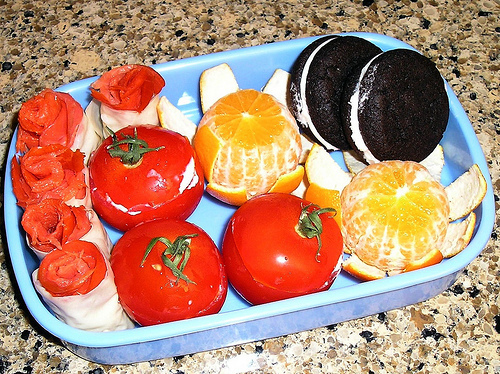 Also some grape tomatoes and crinkle-cut carrots, apples and oranges in extra light syrup (comes in a neat sealed cup, no need to take out and re-pack) and a couple of Little Debbies. I really want to get one of those individual cupcake containers for my desserts, but I’ve only been able to find disposable paper ones. I want something I can wash and re-use. Bread “potstickers” (smooshy white bread flattened with a rolling pin, then stuffed into a gyoza press) filled with pimento cheese. I wasn’t feeling particularly inspired w/r/t fruits and veggies this week, so I just have some quartered campari tomatoes and green olives stuffed with cured ham, and an orange in the sidecar. Also a couple squares of milk chocolate with yogurt filling, which sounded gross but turned out to be surprisingly delicious. 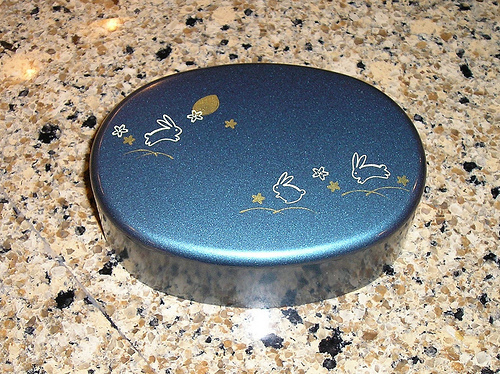 This is the other new box I bought a couple weeks ago, and I like the size. It’s a little roomier than the tiny $3.00 boxes I used to get at Daiso. 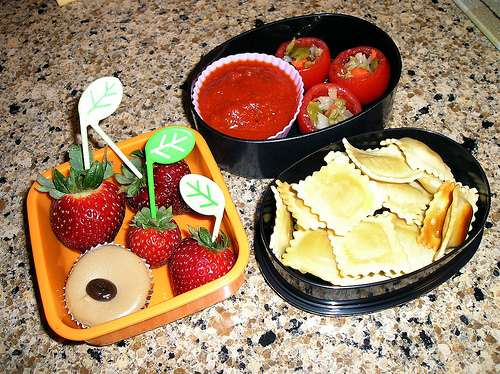 One of my bento favorites this week: baked mini 4-cheese ravioli, with mushroom marinara sauce for dippin’. Also some more tomatoes stuffed with olive salad. 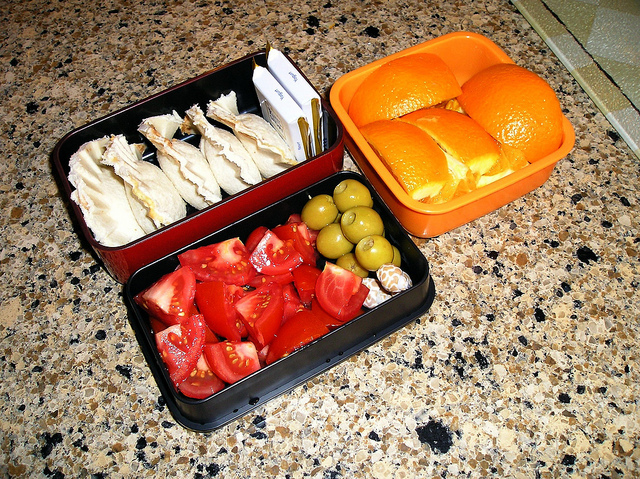 I had them in last week’s bento, but a) they seemed to go with the raviolis, and b) I really like them. SO THERE. For dessert in the sidecar is some strawberries and a mini cappucino cheesecake! This is a new box I bought on Amazon last week. I miss Daiso. Scotch egg (hardboiled egg coated in pork sausage and baked). Campari tomatoes stuffed with olive salad — I was saving this for mini muffalettas, but it’s not like this stuff is hard to come by in southern Louisiana. 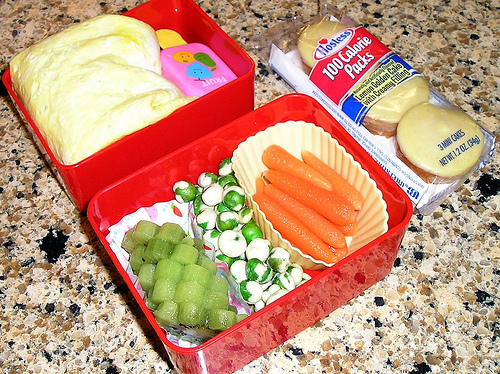 Okay, so this isn’t the healthiest bento I’ve ever packed — no veggies! * — but damn it if don’t look delicious. Smoked salmon rose mini sushi. Campari tomatoes stuffed with onion & chive cream cheese. I had some olive salad that would have also fullfilled the “pickle” requirement, but then I thought of something better I could do with it. 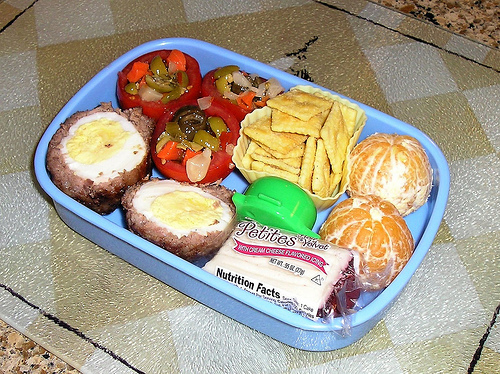 So look for mini muffalettas in an upcoming bento! Top tier: Omurice! Man, it’s been forever since I had omurice. This one contains fried rice with green onions, sautéd mushrooms and a little — UH HUH THAT’S RIGHT — Spam. 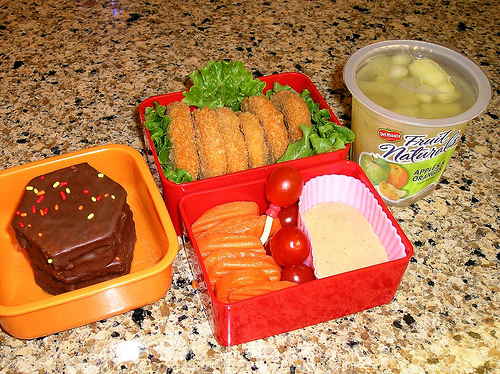 It’s actually the scraps from the Spam flower bento I made a couple weeks ago, I had them in the freezer. 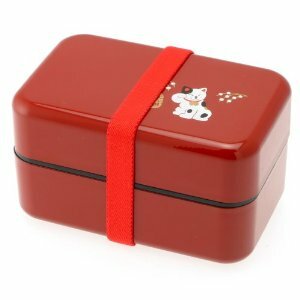 Successful bento-ists don’t waste food. The little fruit container is catsup. Bottom tier: Kiwi flowers, wasabi peas, and more pickled baby carrots. It was a big jar. Dessert is one of those 100-calorie packs of mini Hostess snack cakes. They seduced me from the grocery store endcap yesterday. 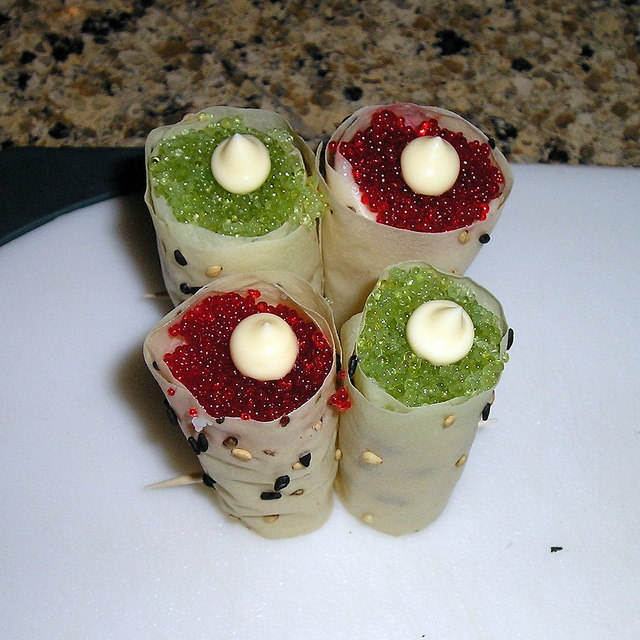 My fake sushi-making skills improved much after I made them a couple of times. It helps to pack the rice down into the cylinder of mamenori once you have it wrapped; it gives it a neater shape and makes a tighter, tidier package; in addition to making room for toppings — in this case, tobiko and just a bit of Kewpie mayo. The thing about sushi is, it was never my favorite thing. If I’m in a Japanese restaurant, there are easily 5 or 6 things I’d order before I ordered sushi. So I’m probably never going to bother making the real thing. But this was fun and something a little different. It’s basically just a fish egg delivery system. I found this tutorial when I Googled “mini sushi rolls”, because the packaging of the mamenori said it was useful for mini sushi rolls. I will definitely be trying that smoked salmon rose one soon. Mine are a little taller, because I didn’t want to attempt working with such tiny pieces of mamenori. It tends to curl up and act difficult when it’s overhandled. THAT’S WHAT SHE SAID.